Kids from all over Australia, in every territory and state, rang in the New Year with the traditional song Auld Lang Syne. The title of the Scottish tune translates to ‘times gone by’ and is about remembering friends from the past and not letting them be forgotten. Sixteen students from Maribyrnong Primary School were hand picked to play a special role the in the filming of the song as part of the ABC Kids New Year’s Eve Special. 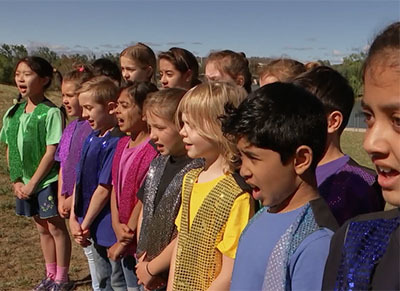 The focus from the ABC was to showcase Australian children of all genders and many cultures, from all over Australia, to come together and sing against a backdrop of their town. The school’s music specialist nominated children who had shown promise, enthusiasm and a love of music at the school. The select students gave up their lunch times to rehearse with the school’s music teacher and executive. Students had a range of emotions about being included in the national ad. “I was nervous, but then bit by bit I got more confident,” one student said. To watch the movie in full, click here. Keep your eye out at 0.52 seconds for the first glimpse of our Maribyrnong movie stars.